Friends of Brower Park met Pastor Stephen Stallard and Teaching Pastor Woodley Victor on June 1, 2014. Brower Park’s new Monarch Butterfly Habitat was ready for its native plants to be placed in the ground. It was late in the day and volunteers were in their second day or work. We were looking at hours of planting work ahead. Emily Sherrod, from Partnership for Parks, pointed to a group having a celebration in Brower Park. Stephen, when approached immediately offered to help and within an hour all the plants had been not only placed in the ground but were deeply watered. Since then the Mosaic Baptist Church has supported the efforts of Friends of Brower Park by providing volunteer groups from all over the country as well as local congregants. This year alone the group has contributed over three hundred hours of hands-on park care hours. They have turned our heavy leaf compost, weeded gardens, raked leaves, created mulch rings to protect our old growth trees, and removed cobble stones from around our trees. 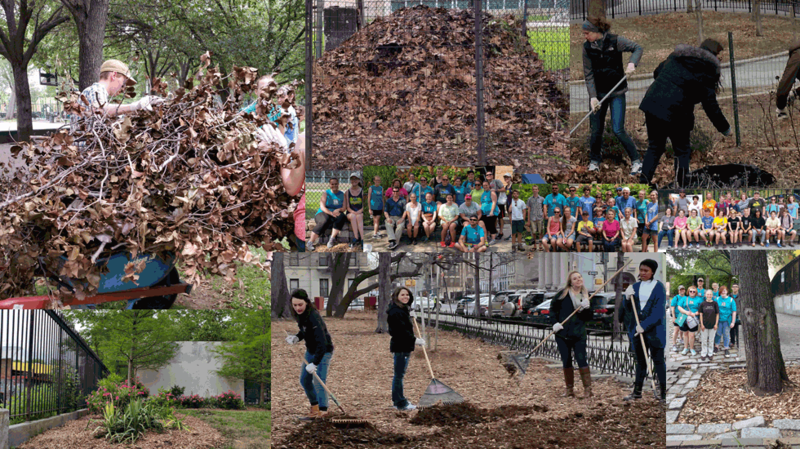 Many tree pits are now filled with mulch to protect tree roots, aerate the soil and provide much needed nutrients. Healthy trees, and well-designed tree pits help reduce flooding, filter pollutants from the air reduce energy usage, provide shade, sequester rain water and provide habitat for wildlife. Friends of Brower Park welcomes and appreciates their support and hard work and commitment to join together to make Brower Park a more sustainable and beautiful place for recreation and quiet enjoyment.